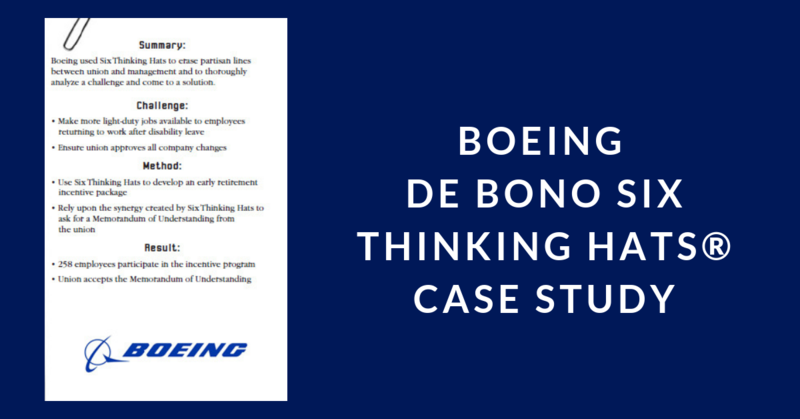 Boeing used de Bono Six Thinking Hats to erase partisan lines between union and management and to thoroughly analyze a challenge and come to a solution. Download our free case study on Boeing Commercial! Transform your team's thinking process with this decision-making and idea evaluation workshop. Your success matters to us, so when you give us a call, you will get a REAL person on the phone. Together, we will figure out exactly what you need and help you get started on achieving your goals!